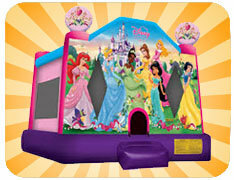 Our Disney Princess themed bounce house features Cinderella, Snow White, Belle, Princess Tiana, Ariel and Jasmine! With beautiful graphics on the side, this bounce house will be a hit with your little princess! This large bounce house features a 15 foot by 15 foot jumping area - a larger jumping surface that our regular sized bounce houses.